What do people really expect when they join us at Studio Table? At this point, we’ve gotten pretty good at formal dinner. 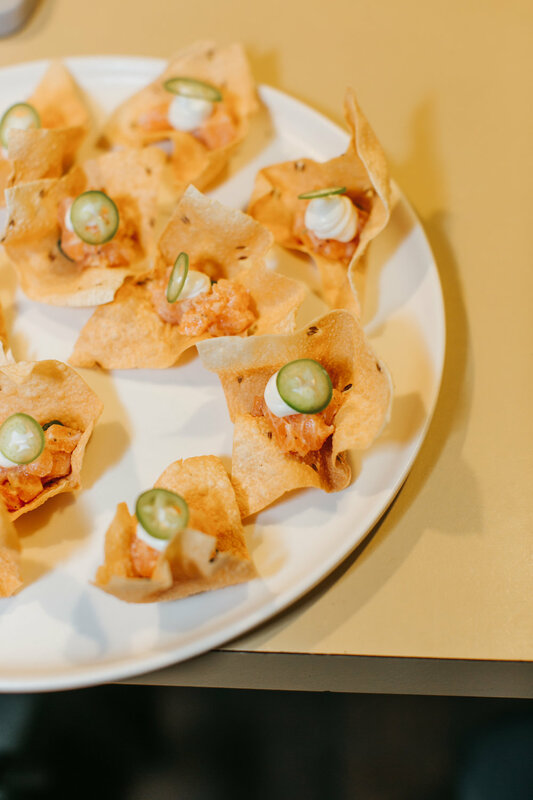 When we hosted our first dinner experience, we had a lot of details to work out - how to create an artful dinner, where to get menus printed, where to stash art supplies - to name a few. We’re proud of how smoothly these meals come together now. No more confusion about where the furniture should go, or how to get a dozen dishes plated in Heather’s little studio kitchen. The menus and the guests surprise us every time, but the operations hum along like a well-oiled machine. Florals by Le Bouquet. Ceramics by Year and Day. But as creatives, anything easy makes us antsy. Wouldn’t it be fun to bring together a bigger group? Does it make sense to put together a cocktail experience instead of a formal meal? What if we tried a different location? Would these changes allow for the conversations and intimacy that our guests had come to love? Last week, we shook things up with a new space and a new format -- our first Studio Table outside the studio. 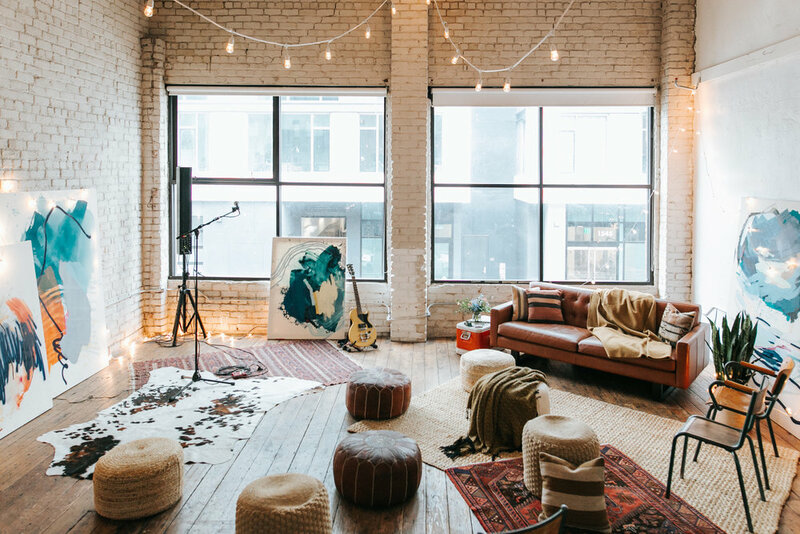 Partnering with Peerspace, the platform that connects people with unique spaces, we found a gorgeous, industrial photo studio in Nob Hill that was big enough for a crowd. With vaulted ceilings, exposed brick walls, and warm, natural light, it felt just like home, especially once we brought in a few paintings by Heather and caught an intimate guitar set with Chase McBride and Doncat. The new space also emboldened us to play with the menu. Ben is a real alchemist behind the bar, and shaking up our operations was a good opportunity to experiment with cocktails and bites instead of a multi-course meal. Beet, Aquavit and horseradish cocktail with charred carrot flatbread. Mango, saffron and basmati cocktail with salmon “poke”. Ginger and allspice cocktail with chicken and mushroom “meatballs” in a spicy coconut broth. By the end of the night, we were very full, a little tipsy, and thrilled to have spent the night surrounded by art, music, food, conversation, and wonderful new friends. Throughout this year, we’re trying out new venues and event formats, and finding ways to push ourselves creatively. But regardless of the format Studio Table takes on any given night, our guests can always know what to expect: great conversation and connections fueled and inspired by art in its many forms. Written by Michelle Wei and Victoria Chao. Photos by Margaret Helfrich. A Note on Partnerships: Studio Table’s community experiences are made possible through paid partnerships with companies that share our values. We’re thankful for companies like Peerspace, which support our creative endeavors, and the creative work of others. All content and opinions expressed in this essay belong to Studio Table.